Comedian Steve Coogan plans to revive his fictional DJ character Alan Partridge in a movie. The spoof presenter last made a brief appearance in this year's Comic Relief, after appearing in four BBC series. "A film is in the pipeline but there are no concrete details yet," a spokeswoman for Coogan's production firm Baby Cow said. 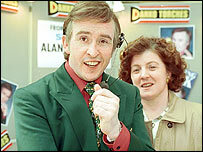 After his last series in 2002, Coogan said he would only reprise the Norwich DJ role in one-offs and TV specials. Partridge began life as a spoof sports reporter on BBC Radio 4's On The Hour before moving to television on BBC Two's The Day Today. The character then hosted spoof chat show Knowing Me, Knowing You before his sacking and breakdown was documented in two series of I'm Alan Partridge. Coogan subsequently appeared in movies including The Parole Officer, 24 Hour Party People and Around the World in 80 Days. A previous Perrier Award winner at the Edinburgh Fringe Festival, his other comic characters include Paul and Pauline Calf.